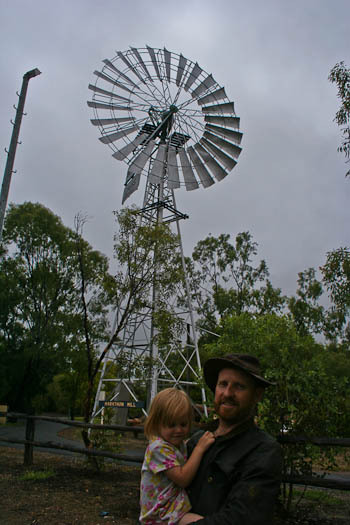 Our next stop was under the spinning blades of an old windmill situated in the botanic gardens at Emerald. We only found the location by accident, but it was comfortable enough to entice us to stay for a couple nights. As we slept in the trailer, we could hear the blades going around and around, pumping up water from the ground to water the botanic gardens. It looked like it would be fun to climb, but we didn't get around to scaling its height. We did let the girls play in the water pouring out of its pipe however. 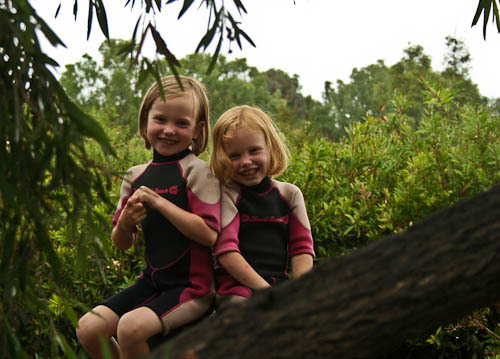 It was a bit cold, but the girls dress in their wetsuits and manage to enjoy playing in all sorts of weather! 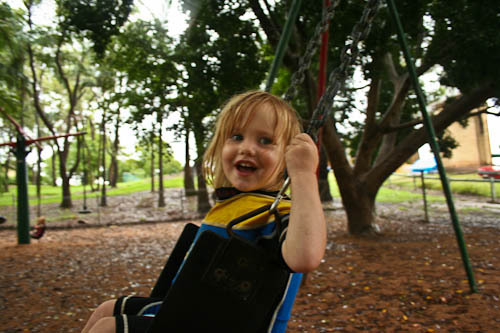 We enjoyed the opportunity to explore the whole botanic gardens, discovering lots of fun places in which to play. 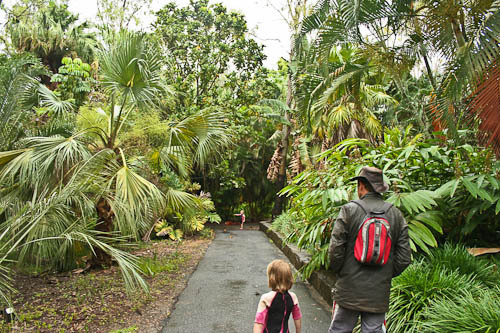 Although they contained many different pathways throughout, the botanic gardens weren't immaculately maintained but were left to grow a bit wild. This only added to their charm. 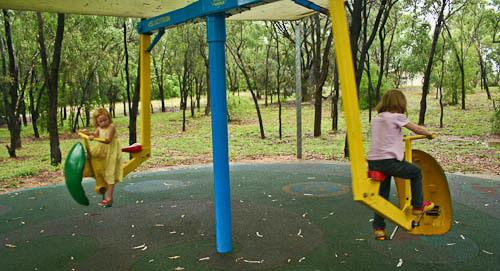 The girls enjoyed the man-made playground structures and demonstrated new skills on the equipment. 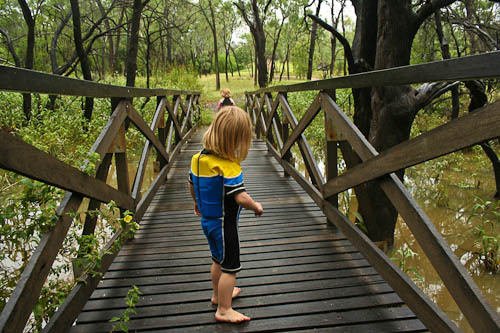 We find that whenever we expose them to new experiences, their learning increases exponentially. It was raining during most of our visit, but this didn't slow us down! 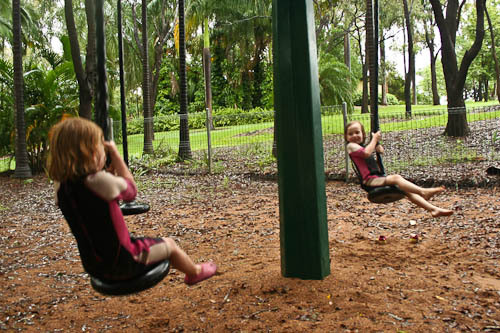 We haven't ever been inclined to visit botanic gardens before. 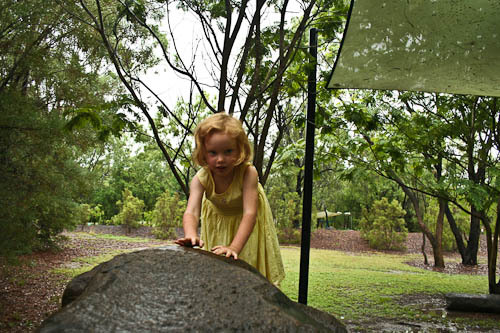 In fact, Brisbane is home to the renowned Mt Coot-tha Botanic Gardens, but we've never visited them! This visit to Emerald has changed David's and my attitudes towards them. 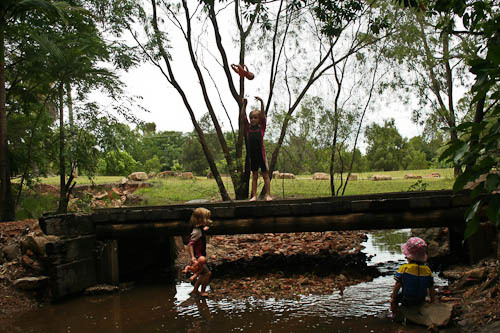 Streams criss-crossed the gardens, and the girls took their dolls for a swim. Sometimes the mud seems to hold more attraction for the girls than the water. After I called the girls to look at the snake eating this little frog, it moved away in defense. 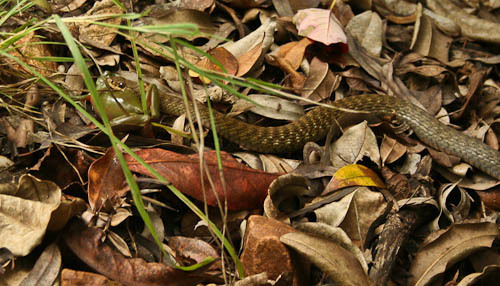 It was a good lesson in 1. snakes are scared of humans and 2. snakes prefer to bite frogs. 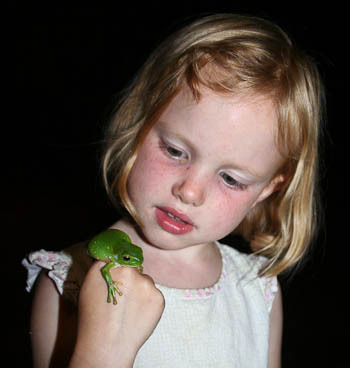 Later we found a beautiful green tree frog. "This is like the one that was being eaten!" Brioni declared. 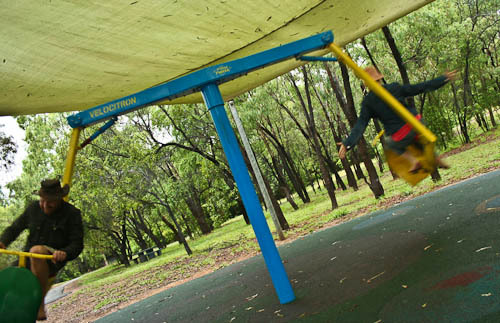 This park was memorable for us because of a number of special features. There were lots of different spaces to explore. Aisha and Brioni really enjoyed going round and round on this Velocitor. 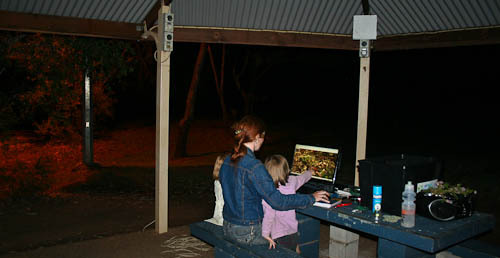 And my favourite thing was the powerpoints available in the covered areas of the park which meant I could use the computer again. We also stayed up late one night watching a movie with other campers. 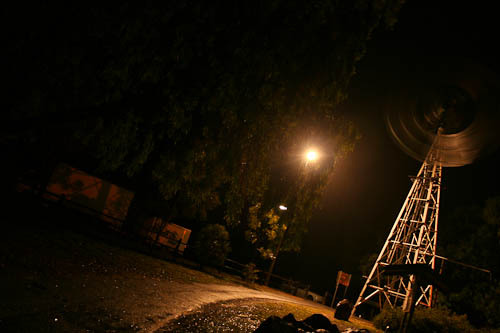 Before we arrived in the central Queensland town of Emerald, I didn’t really know much about this part of Queensland that has been made prosperous by the mining boom. As multi-national companies increase their profits by stripping the Australian soil of its natural resources, everyone tries to cash in on the winnings. But we liked walking around Emerald, shopping for some essentials and talking to the locals. We visited electronics stores in search of walky-talkies (we don’t want those girls getting lost again!) and stopped in at all the op shops. One morning, we wandered past a playgroup operating out of an Anglican church hall, and because we so clearly fit the demographic, we were invited in! I was pleased to sit down for a while with a cup of tea while the girls played indoors. 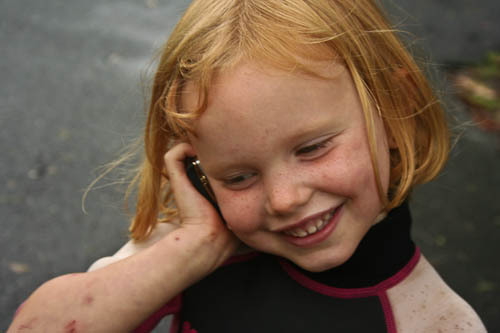 The phones added a new element to the girls' imaginary play. It was a great place to stop. We really enjoyed the relaxed camping and spending time with other transients who also used the facilities at the botanic gardens. All the same, this is probably the furthest west and north in Queensland we’ll travel on this trip. We’ve been speaking to Woodoo who needs some more help back in Grafton. He’s been sifting through his possessions after the house fire, and we’ll start making our way back south to him. We must be close to you- we are in Yepoon tonight. I actually applied to work in Emerald for 6 months 5 years ago, but the paperwork didn’t go through.